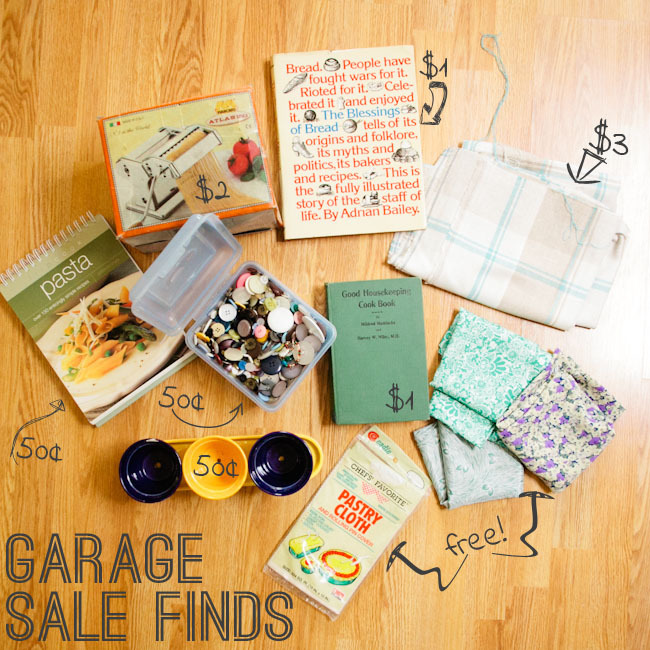 garage sale finds | .liveit.loveit.blogit. I have a love/hate relationship with garage sales. I love happening upon garage sales with good deals and sweet stuff. I hate heading to garage sales with a particular item in mind. I love garage sales where people are just trying to clean out their homes, and price their goods accordingly. I hate garage sales where people really value their stuff and price their goods accordingly. I love the random sweet finds. I hate the dust. And the love/hate list goes on and on. But the very, very best thing about garage sales? The deals. Last weekend we spent $8.50 at various garage sales and got some sweet, sweet deals. $2.00: A pasta maker.Check back tomorrow for a report on our first homemade pasta. $1.00: An old bread history book and recipe book. $3.00: Plaid linen fabric. Will make an awesome … something. $0.00: Silk linings. Thrown in with fabric purchase, likely to be used for art. $0.00: Pastry cloth. Thrown in with pasta maker. $0.50: Set of three cermamic pots for windowsill herb garden. $0.50: Pasta cookbook. (Includes instructions for pasta making). $0.50: Bin of buttons—including tupperware. $1.00: Good Housekeeping Cookbook—dedication 1931. Deals of the weekend: Pasta maker (a similar one is selling on craigslist for $30) and the bin of buttons. Splurge of the weekend: $3.00 fabric. It was my first purchase, I wasn’t just getting warmed up! Garage sales. Love them? Hate them?